The Association for Fighting A-T Disease, a non-profit organization in Israel that aims to save children from the devastating disease Ataxia-Teleangiectasia. A-T is a rare, highly debilitating congenital disease with a relatively high incidence in Israel. It is a genetic, progressive, degenerative disease that affects many systems of the body simultaneously. Symptoms of the illness are manifested in the first two years of life when ataxia, or lack of muscle control, marks the beginning of a progressive degenerative process. In the following years, the sick children have difficulties in walking or moving their limbs, speaking and focusing their sight. By the end of the first decade of their life, they depend on wheelchairs and the help of others. Another characteristic of A-T is the damage it inflicts on the children’s immune system, causing them severe infections, that can be life threatening, as well as reoccurring pneumonia and making them susceptible to cancerous disease. There is, at present, no cure for A-T and no way to stop its development. However, as a first step in the right direction, Prof. Yossi Shilo of Tel Aviv University discovered the gene that causes A-T in 1995, thus turning Israel into a center of research recognized worldwide. Since A-T causes multi-body systems’ failure, its research may lead to advancement in discoveries surrounding other diseases such as cancer, HIV, Alzheimer, Parkinson, etc. Therefore, the Association invests vast resources in promoting research in Israel and fosters global collaboration in this field. The Association for Fighting A-T Disease was established in 1999 to save children who are born with A-T and provide intervention and treatment as soon as the disease is diagnosed. The Association supports the sick children and their families throughout their daily struggle and suffering and works to increase awareness to the disease and testing amongst the medical and general population, so that fewer babies will be born with the disease. The Association also implements intervention programs to help alleviate the emotional and social isolation of families with children with A-T and encourages research of the disease in the hope that a cure for it may be found.Additionally, the Association also distributes professional information on its symptoms, treatment methods, proactive therapies and current medical care to community doctors as well as conducts exposure days for at risk populations. The Association offers assistance in funding Respiratory Physical Therapy treatments, in purchasing of wheelchairs and rehabilitation equipment, in funding travel expenses to hospitals and treatment facilities, and assists in funding emotional support for patients and family members and organizes leisure activities. Additionally, our resident Social Worker accompanies the families and provides assistance whenever needed. The Clinic was established by the Association in 2004, and is currently funded by it. Today the A-T Clinic in Israel serves as the second leading center in the field of research and treatment of A-T in the world. The Clinic coordinates the overall treatment for the children by the various expert doctors, and devises a rehabilitation plan to be implemented by local doctors in the community. The Association works to increase awareness to the A-T disease and conducts testing amongst the medical and general population, so that fewer babies will be born with the disease. It distributes professional information on its symptoms, treatment methods, and proactive therapies and current medical care to community doctors, as well as conducts exposure days for at risk populations. The Association conducts research of the disease in the hope that a cure for it may be found. 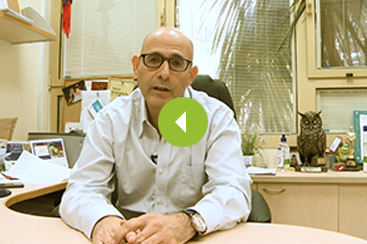 Prof. Yossi Shilo of Tel Aviv University discovered the gene that causes A-T in 1995, thus turning Israel into a center of research recognized worldwide. Since A-T causes multi-body systems’ failure, its’ research may lead to advancement in discoveries surrounding other diseases such as cancer, HIV, Alzheimer, Parkinson, etc. Therefore, the Association invests vast resources in promoting research in Israel and fosters global collaboration in this field. In 2004 the Association established the first Centralized Treatment Clinic in Israel for children with A-T in the Sheba Medical Center. The Clinic offers diagnosis, treatment and rehabilitation in immunology, neurology, respiratory/pulmonary dysfunction, endocrinology, oncology, dental, orthopedics, gastro, swallowing disorders, physical therapy and adaptive services to children suffering from A-T. It coordinates the overall treatment for the children by the various expert doctors, and devises a rehabilitation plan to be implemented by local doctors in the community. Furthermore, the Clinic provides genetic counseling and tests for populations that carry the ATM gene (ataxia telangiectasia mutated), and for those that have no known mutation. In 2006 the Clinic was recognized by the Ministry of Health as the National Treatment Clinic for children with A-T. Prior to its establishment, children with A-T were treated in their various communities by different doctors, who did not specialize in the disease and were not familiar with its intricacies. This consequently made it difficult for them to fully understand the patients’ needs; thus the quality of treatment was jeopardized. The Clinic’s multi-disciplinary team of experts work and maintain contact with the A-T Clinic at the John Hopkins Hospital in Baltimore, Maryland (a model center on which the Clinic in Israel was established). They also attend international conferences such as the International Clinical Research Conference on Ataxia-Telangiectasia or the A-T Workshop (ATW), which draw together the world’s leading figures in research of A-T.
Today the A-T Clinic in Israel serves as the second leading center in the field of research and treatment of A-T in the world.The Clinic is vital to improving the life quality of A-T patients and increasing their longevity. Recently the A-T Clinic was transferred to the Pediatric Pulmonary Unit of the Edmond and Lily Safra Children’s Hospital under the management of Prof. Ori Efrati. The Pediatric Pulmonary Unit manages the medical records of all A-T patients, with an emphasis on the pulmonary system. The medical staff of the Pediatric Pulmonary Unit includes paramedical therapists, a physiotherapist, a nutritionist, a coordinating nurse, a social worker, a senior clinical psychologist, a lung specialist, and a clinical pharmacist. Today the coordinating nurse and the social worker are employed in part time positions by the Association for Fighting A-T Disease. From now on the coordinating nurse and the social worker are part of the medical staff of the Pediatric Pulmonary Unit. This groundbreaking organizational change has occurred recently. It will also serve as a model for organizational and service management in other A-T Clinics in the world. In order to ensure that A-T patients improve their life quality, we continuously develop new projects in line with the children’s growing needs. TheAssociation for Fighting A-T Diseasefunds the operational costs of the A-T Clinic, including the funding of the personnel. To leverage the Clinic’s capabilities and to offer more effective services to A-T patients, TheAssociation for Fighting A-T Disease is looking to expand the staff to include a Managing Physician (in a part time position), a Respiratory Physical Therapist and to expand the position of the Coordinating Nurse to a full time position. The Association bears their expenses. The Coordinating Nurse is trained and has extensive experience and knowledge in every facet of the disease and can give the patients the full and multidisciplinary treatment they need and which they don’t receive outside the Clinic. The Coordinating Nurse provides tens of A-T patients and their families with the following activities: treatment to ease the pain, stress and anxiety children with A-T experience while undergoing treatments; follow-up to children with A-T to delay the progress of the disease; tests for young couples to undergo testing and prevent the occurrence of the disease; maintains contact and offers information for the various medical and social service personnel to increase awareness to A-T and share the specific problems and needs of sick children and their families; necessary equipment to children with A-T to alleviate their lives by learning to live with the difficulties caused by the disease; professional assistance, psychological and social support, counseling and guidance to the sick children and their parents who face many complex issues. The Managing Physician is an expert physician in the field of A-T. We would like to employ a Managing Physician in a part time position to direct the Clinic. The Managing Physician will maintain contact with experts and clinics in the field of A-T in Israel and the world, he will diagnose patients, provide a multi-disciplinary intervention plan based on the needs of the patients and recommendations of professionals. The Managing Physician will provide guidance and counseling to children with A-T and their families during treatments, urgent medical treatments and hospitalization. The respiratory physical therapist will provide training to physical therapists whoprovide life-saving respiratory therapy to A-T patients. Children suffering from the degenerative disease of A-T need constant paramedical treatments to slow down the progress of the horrific disease and improve the patients’ quality of life. Those who suffer from A-T gradually develop a chronic lung disease expressed as chronic changes of the respiratory system and as a result the ability to breath properly is lost and the lungs get filled with mucus. The immune deficiency causes repeated infections of the respiratory system that develops further the lung disease. Chest physiotherapy is especially crucial for A-T patients, because it helps them to keep their lungs clean and prevent phlegm accumulation, which can cause irreversible damage to the lungs. Doctors and experts recommend that patients’ lungs be cleaned at least twice a week. Therefore, professional physiotherapists visit children suffering from A-T in their homes to perform respiratory physiotherapy twice a week. Physiotherapists of the Association provide chest physiotherapy for children suffering from A-T throughout Israel. This crucial treatment is very expensive and is not covered by the standard national health insurance. However, funds for TheAssociation for Fighting A-T Disease are scarce and the salaries to pay for the full-time position of the coordinating nurse and the part-time position of the Managing Physician and Respiratory Physical Therapist are an expenditure we cannot afford without outside assistance. In Israel today, there are dozens of children living with A-T disease and we aspire to do all that we can to improve their quality of life. However, the Association receives very little public funding for its activities and we are constantly in need of assistance in order to carry out our objectives. Since the Association’s emancipation, over 80 patients and their families enjoyed our services. Each year approx. 2 new patients are diagnosed with A-T.